Much of the music we call praise and worship is safe, middle class and white. NOEL ROBINSON is seeking to change that. He spoke to Stuart Dearsley. 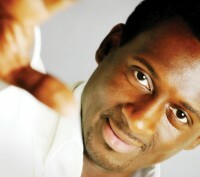 Apart from Graham Kendrick linking up with producer/keyboardsman Steve Thompson to latterly bring a black gospel tinge to some of his songs, the Christian music industry has been very slow in exploring the vibrancy of worship expressed in the hundreds of British African and Caribbean fellowships. Despite the BBC's Gospel Train radio series clearly demonstrating the huge talent in black churches; it's only been Alliance's recent launch of a British black gospel label that has shown that British CCM companies have any consciousness of one of the fastest growing parts of the British church. Maybe a musician/worship leader like Noel Robinson can begin to right this woeful lack of support. Lead guitarist with the Graham Kendrick band, his self-financed CD 'O Taste And See' brought an R&B vibrancy into a set of songs, largely aimed at congregational worship, and has attracted media interest (an enthusiastic article in New Christian Herald) and a Christian bookshop distribution deal (via Kingsway/STL). The son of West Indian parents, Noel grew up in North West London attending a branch of the Church Of God Of Prophecy which is the largest black church in England with fellowships in most of the major British cities. Noel is married with two children and lives in Mitcham, Surrey and attends a church in Tooting, South London, where he is also the worship leader. Influenced by a variety of sounds including R&B, soul, jazz and Caribbean, he has carried many of these on to his first release 'O Taste And See'. "The idea for the album came about two years ago," said Noel, "when I was doing an album for someone else and they encouraged me to seriously think about doing one of my own. I began to write and God really started to speak to me and to give me more and more songs. God also used this as a time to teach me and I learnt a lot. Kevin Simpson, a friend of mine and a member of my band, wrote on a few of the tracks and a second album will hopefully be coming out later in the year." 'O Taste And See' features a variety of tracks under titles such as "Dance Before The Lord", "Let The Words Of My Heart" and "Praise Groove". I wondered whether Noel had any particular favourites. "Personally speaking, I would say 'Let Your Light Shine In Me', which was the first song that I ever wrote. At the time God was doing something very special in my life and he was giving me so much and I just feel that this song gives God the glory he so richly deserves." "Praise Groove" features Michelle John-Douglas on vocals and rapper The Gifted and is in a much funkier style. "Both are good friends of mine and I asked them to help me out on this track as they could do it far more justice than I could," commented Noel. So what style does Noel prefer? "Well, to be honest I don't really have a style. The album itself is not really a true reflection of the band live...we're a lot, lot better than that! You can capture things a lot better live, but if I had to say something, I would say that it is a collection of styles and is a cross between English and American and where God is at the present time. In black churches, you don't tend to hear many of your songs by people like Graham Kendrick and Martin Smith. We tend to sing more American styled ones and I am trying to introduce new songs written from a black British perspective." Noel Robinson is a much respected guitarist and having grown up in church it was no surprise that music featured from an early age. "My father was a guitarist and my mother played the piano and at about the age of eight I was encouraged to play the guitar. My Father taught me a lot and I studied at school and I played double bass in the local youth orchestra. Since then I've played on numerous Kingsway albums and played with so many artists that I can't remember most of them. There were people such as CeCe Winans, Deniece Williams. Gloria Gaynor, Ron Kenoly and Graham Kendrick. I was also resident guitarist on an '80s TV gospel show called People Get Ready." Ron Kenoly and Graham Kendrick are both big players on the praise and worship scene. How did Noel come to be involved here? "I worked a lot for BBC TV and radio and was musical director for a lot of gospel shows and Ron Kenoly developed through that and I'm now his musical director! Graham Kendrick happened about eight or nine years ago at a time when I was searching for answers in my life. I was still going to church but wanted to use my talents to earn money and to glorify God. I wanted to get out into the big world. It was then that I was asked to do the Prayer For Revival Tour and Graham Kendrick was on it. I've recently come back from playing in his band at Spring Harvest." So what was that like? "Spring Harvest was great. I really enjoyed it. It was very hard work but a great time of refreshing and the sight of people expressing themselves and full of joy really moved me." And Ron Kenoly? "Well, at the end of April I'm going on a European tour which visits places in Switzerland, France, Italy, Germany and Norway. After that I'm off to do music live with Deniece Williams, Candi Staton, Kellie Williams and Jessy Dixon. I'm also preparing for the National Convention of the Church Of God Of Prophecy which is in Brighton in July. We're at present finishing the production of a church album for the convention and this features both young and old joining together in praise to God." Noel Robinson certainly lives a busy life and fitting this interview into his schedule was no easy job. I asked him to sum up what he sees as his purpose in life. "I want to see all men and women come to know a true and living God through what Jesus Christ has done for us. If my music and ministry can help in any way to achieve this aim then that will do for me."